A wounded Israeli soldier arrives at the Hadassah Ein Kerem in Jerusalem on November 6, 2015 after he was shot and seriously wounded near the Palestinian village of Beit Einum, the army and medics said. The Israeli army said Saturday it had detained a 16-year-old Palestinian who it says “confessed” to shooting an Israeli soldier outside Beit Einun east of Hebron the day before. An Israeli army spokesperson said that the teenager from the village of Bani Naim near Hebron was detained overnight and had since confessed to the carrying out the shooting. She said that he had “handed in” the weapon he used. The Israeli soldier was severely wounded in the attack that took place at a road junction outside Beit Einum on Friday evening, the spokesperson said. 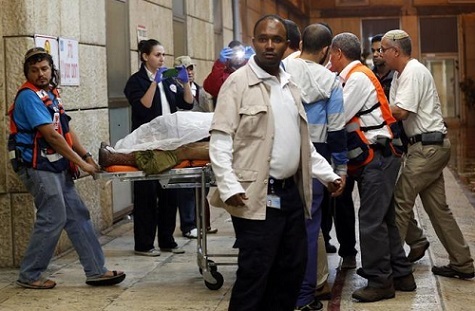 Hadassah Hospital spokesperson Hadar Elboim reported on Saturday evening that the IDF soldier wounded by gunfire near Hebron on Friday night has undergone neurosurgery and remains in life-threatening serious condition. He remains sedated and on a respirator in a neurological intensive care unit.